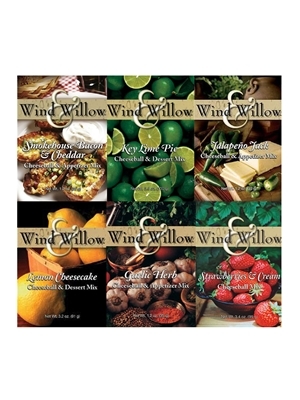 This wonderful gift set is your choice of six of Wind & Willow's selection of over 25 varieties of cheeseball, appetizer and dessert mixes. Choose from the items listed for the first cheeseball to be included in the gift box. Choose from the items listed for the second cheeseball to be included in the gift box. Choose from the items listed for the third cheeseball to be included in the gift box. Choose from the items listed for the fourth cheeseball to be included in the gift box. Choose from the items listed for the fifth cheeseball to be included in the gift box. Choose from the items listed for the sixth cheeseball to be included in the gift box.